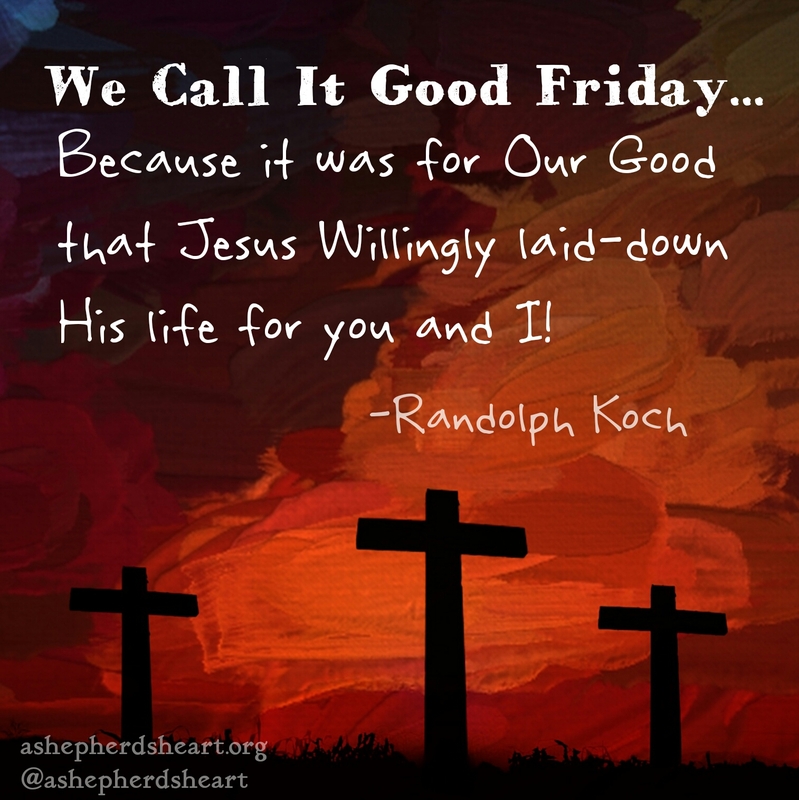 A Shepherd's Heart: We Call It Good Friday...Because it was for Our Good! 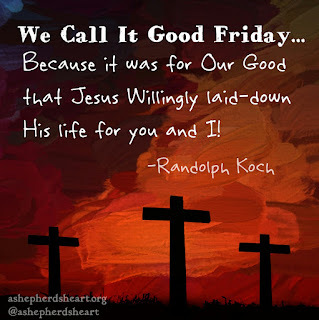 We Call It Good Friday...Because it was for Our Good! Read: Matthew 26:36-28:15, Mark 14:32-16:14, Luke 22:39-24:53, and John 18-21:14. It was the darkest day of all time. The day Jesus Christ the Savior was crucified. Humanly speaking, there was nothing good about that day. Everything went south in a hurry! The Gospels recount for us the physical and verbal abuse that was inflicted on Jesus and that He bore on our behalf. The shouts of, “crucify Him, crucify Him,” The blows to His body by the whips and rods, The suffering of carrying the cross on the road to Golgotha. The nails driven into his wrists and feet, the anguish as He hung on the cross with a sign above Him mockingly stating who He was, yet with no crime committed, He was crucified. The vinegar given to Him to drink instead of water when He was thirsty, Then His last words and last breathe- it was finished. Simply unfathomable what He endured! Yet, because of the Father's divine plan of redemption, Jesus, long before He would come to earth in the humble form of man, God chose to send Him as the payment for our sins and the way of salvation. The scriptures also state in the prophetic books of the Old Testament that the Father was pleased to crush Him. This was because He loves us so much He wanted to do everything possible for us to see the folly of our ways and that Jesus is, and came as - the Savior. Jesus is the only plan of Salvation for us from the heart of God. There is no other way we can earn or work our way to heaven. Because of sin we aren’t worthy of God’s forgiveness. Through Jesus Christ we are worthy- only because of His death on the cross. Each year goes by and we come to the Easter / Resurrection remembrance time. I often wonder if we stand in awe humbly to think about what the Father supplied for us through Jesus’ death on the cruel cross? Do we thank Him for it? Are you and I sobered by the reality of all He suffered at the hands of all mankind because of sin? Or are we complacent? Do we as believers just go through the motions with a “been there, done that,” attitude forsaking all He has done for us? As we celebrate His resurrection with Joy and thanksgiving, let us also worshipfully remember Jesus and the Father through His Crucifixion, His burial, and also His resurrection. Let us never forget why He died in the first place and let us be sure that we are right with Him. Let us stand in awe that even in His sufferings, Jesus thought of you and I. He even thought of those who physically crucified Him when He said, in my paraphrase, “Father forgive them for they don’t know what they are doing.” What love the Father has for us and what love Jesus Himself has for us! As we reflect on His resurrection, let us never forget the day He laid down His life for us. Today we remember His death on what is known as "Good Friday". 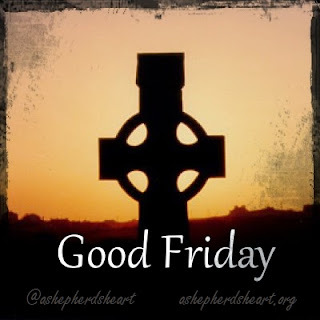 We call it Good Friday because it was for our good that He died for us that we might have Salvation. I pray that we never take what He did for granted! -Can you fathom His act of love? -Do we humbly stand in awe to think about what the Father supplied for us through Jesus’ death on the cruel cross? Do we thank Him for it? -Are you and I sobered by the reality of all Jesus suffered at the hands of all mankind because of sin? Or are we complacent? -Do we as believers just go through the motions with a “been there, done that,” attitude forsaking all He has done for us? Sunday is Coming! Then we'll celebrate and shout, HE IS RISEN, HE IS RISEN INDEED! P.S. Share This With Someone: "Salvation is Free but it Cost Jesus Everything and He did it willingly for you!"